Yesterday we’ve told you about the new announcement coming from Bitmain about their acquisition of the Snowbal.io service that is now called Hashnest and about their plan to start selling cloud mining hashrate via the new platform. 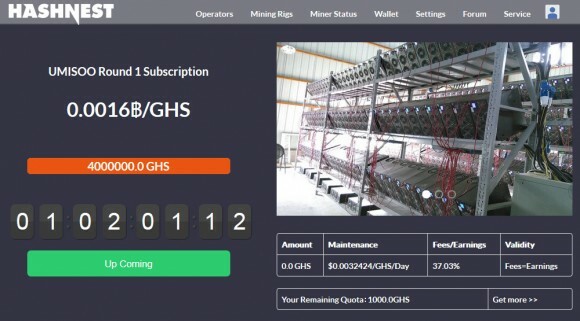 They have already started selling the initial offering of 4 Petahashes worth of hashrate powered by AntMiner Bitcoin ASIC miners today and we have already purchased 100 GHS to try out the service. Initially the price per GHS was supposed to be 0.0016 BTC, but it has apparently been lowered to 0.00135 BTC making the offer more attractive even though the maintenance fee is still at about 37 percent which is a bit higher than we would want to see it. But since the maintenance fee is quoted in USD per GHS with increase of the Bitcoin price the fee percentage should get down to a more acceptable level. With the new price per GHS and the current maintenance fee with a more moderate 10% average increase of the Bitcoin network hashrate you can expect to see a ROI in less than 8 months, not that great, but not too bad either, especially compared to some other recently launched alternatives that we’ve covered. So while not great profitability wise, that offer does not seem that bad either compared to many of the available alternatives and even compared to the initially announced higher price per GHS. The hashrate you purchase will be valid and mining for as long as the mined coins are more than the fees collected by the service, so the downside could be if the hashrate you purchase becomes unprofitable in less than 8 months. We have purchased 100 GHS for 0.135 BTC just to test out the service and to give out some firsthand experience. It seems that Hashnest does need to do some more translation in English and improve the translation of some of the already translated in English texts. Also the statistics you get is not very detailed and the graphs for the hashrate are not for your own hashrate, but for the overall hashrate of the cloud mining contracts offered through the platform from the provider UMISOO. So currently the Miner Status page is not very informative apart from the data in the table you get about your purchased hashrate and the “Unassigned Earnings” which apparently is the amount you have mined so far. Other than that you should know that in order to purchase Bitcoin mining hashrate from Hashnest you should first deposit Bitcoins in your account and then you can pay with them for hashrate. The confirmation of the transaction and the availability of the Bitcoins in your account is pretty fast and after you have them in your balance the purchase and allocation of the paid hashrate apparently happens instantly. We’ll see how the service will continue to evolve, but it seems that it needs some work on the user stats for the new cloud mining functionality and the rest is apparently already working quite well. Bitmain, one of the top names among the Bitcoin ASIC miner manufacturers, has announced their acquisition of Hashnest – a cloud mining platform which was originally named Snowball Exchange (Snowball.io). Hashnest’s goal is to operate independently in order to build a reliable, economical and decentralized platform that serves the worldwide mining enthusiasts and hosting operators according to the new owner. Originally Snowball was more of a trade platform where you buy and sell actual hosted miners and popular only in China, but it seems that they are moving to providing hashrate to users that is backed up by a large mining farm(s) and opening to the rest to the world. We are not surprised from this news as we’ve recently discussed that cloud mining is going to become more and more attractive alternative to using physical miners for users that are mining crypto currencies. Do note however that as far as Hashnest is considered it is not regarded as a cloud mining service, but as a platform and there is a difference. UMISOO, the first operator on Hashnest will provide 4 PHS of hashing power, and plans to start the Round 1 subscription at Beijing Time 22:00pm, 2nd September, 2014 (UCT+8:00 Time Zone). The price is flat at 0.0016 BTC per GHS. Due to the anticipated high demand, each user is limited to a maximum of 1000 GHS by default, though this limit can be increased further. The Round 1 hashrate is generated by AntMiner S2 mining hardware (4000 units) with a maintenance fee of $0.0032424 per GHS per Day. Doing some calculations if you purchase 1 THS hashrate you will currently be earning about 0.01834 BTC per day (about $8.78 USD) and the maintenance fee will be $3.2424 USD or the fee is about 37% of what you earn at the moment. The fee is a bit high, though the price per GHS on the other hand is very attractive compared to what other alternative cloud mining operations are currently offering. Even though doing some long term calculations it would take more than a year for you to just ROI, unless of course there is some significant increase in the Bitcoin price that will cause the fee percentage to get lower as it is calculated in dollar price.